Twitch has announced that it is creating its own "games with" program that will give Twitch Prime members five free games every month. The company has given away free games to Twitch Prime owners in the past as well as in-game content, but it is now looking to rival PS Plus and Xbox Games with Gold with its own unique service. In order to gain access to the service, you must own a Twitch Prime account that is linked to your Amazon account. You will also need to be a subscriber to Amazon Prime. The first five games that will be available from March 15 to 31 include Superhot, Oxenfree, Mr. Shifty, Shadow Tactics, and Tomb of Annihilation. These titles will then be replaced by Tales from the Borderlands, SteamWorld Dig 2, Kingsway, Tokyo 42, and Dubwars from April 1. Additionally, all eight tiles from the Twitch indie Amplifier program will feature as free titles over the course of the next few months. Shadow Tactics and Tomb of Annihilation are two examples from this. 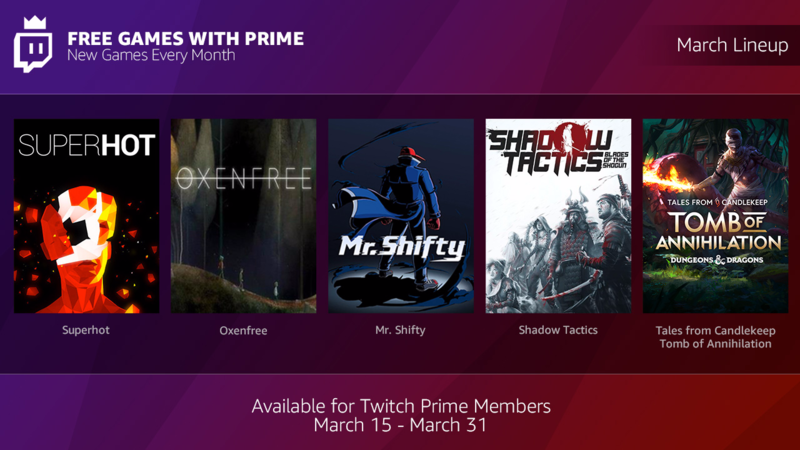 All the titles put into Free Games With Prime will be available permanently after being redeemed, but you'll only be able to access and play them through the Twitch desktop app.